Before I begin the review, let me clarify – I am no critic, nor connoisseur. I think the above lines sum up the entire book. The fact that it took her so many years to actually publish her first ever book, justifies the maturity of every word written. Poetry is difficult because much is said in little and to have a poetry book published is a fantastic achievement. She begins with the poem ‘Angelina Jolie 3000 AD’ which has it’s references to a Hindu book, Bhagavatam and talks about letting go of world pleasures [psst.. she would love Angelina Jolie to read the poem, if any of you can make that happen]. This is followed by an introspective piece called ‘Dimensions’ which is my personal favorite. 18 poems follow building a vortex made of emotions, ideas, religion, men, demigods, gods, world, politics, wedding, nature and many such elemental themes. The exploration ranges from discussion to dialectics to satire leading towards the revival of nature and man. ‘Moon Lit Pageant Show’ – showcases all the beautiful wonders of the world and leaves the touch of an environmentalist at the end. ‘The Great Portrait Artist (MFF Hussein Speaks)’ – paints an imaginative insight of the great artist and one of his work, a very artistic touch and feel from an artist of words. ‘The Journey’ – perhaps the best satirical poem in the book which talks about mankind not respecting things and our dying need to exercise control on the world. ‘The Undoing’ – a questioning poem for every youth, a chance to look back and introspect. ‘The World 2150’ – imagine living in 2150 when the world would’ve lost it’s charm with the rate at which we are depleting our resources. My biggest attraction of this book was the Synopsis after each poem. Poetry is not widespread among the circle of readers in India and it is justified because we have not “sold” poetry yet. The key to understanding poetry is to decipher the perspective the poet wants to present using minimal words. It is also to find your perspective through the poet’s eye based on your experiences. To build such an atmosphere, cultivation of a poetic mind is essential which the synopsis helps achieve. 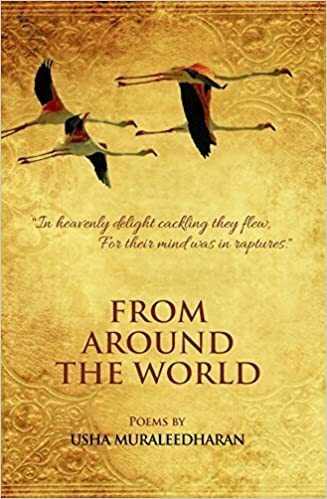 Conclusion – If you are a new reader or just venturing into poetry – grab this book, though I will not lie to you that this book will not compel you to think (which poet wrote without the desire to awaken the masses, I do not recollect). If you are or have been reading, here is an honest and bold attempt by a lady to seek out her passion which has produced a truly commendable first work.